Our biggest learning curve has been figuring out how to immediately deal with preserving the produce we won’t eat in the first few days. The New York Time’s Raw Panic article gave us a lot of good pointers. 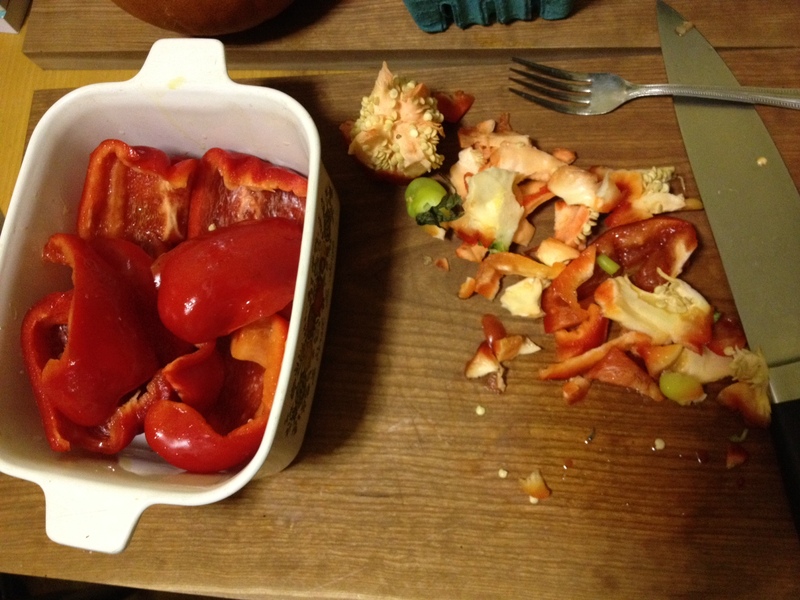 As a result, some of our red peppers were immediately chopped up. 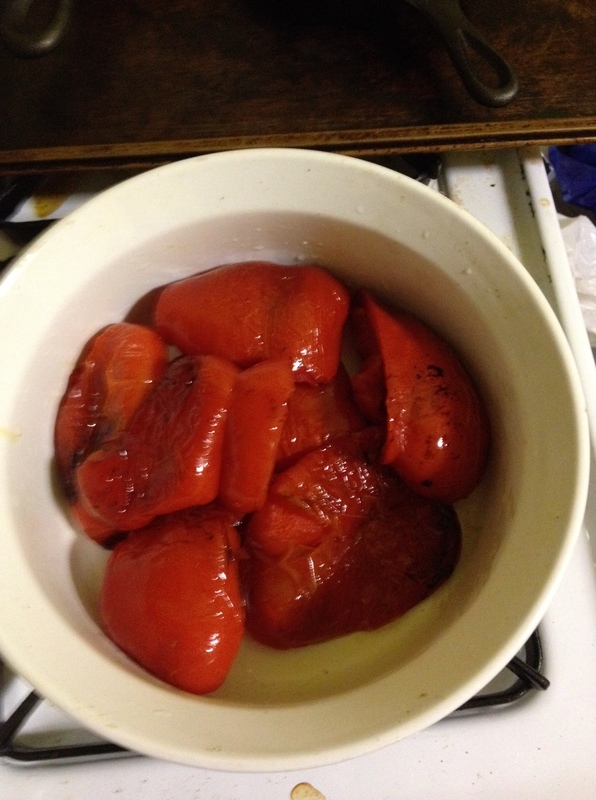 Mary made a marinade for the peppers which was inspired by Ottolenghi’s book Plenty. If you’ve not seen this cookbook, I’d advise you to take a look! 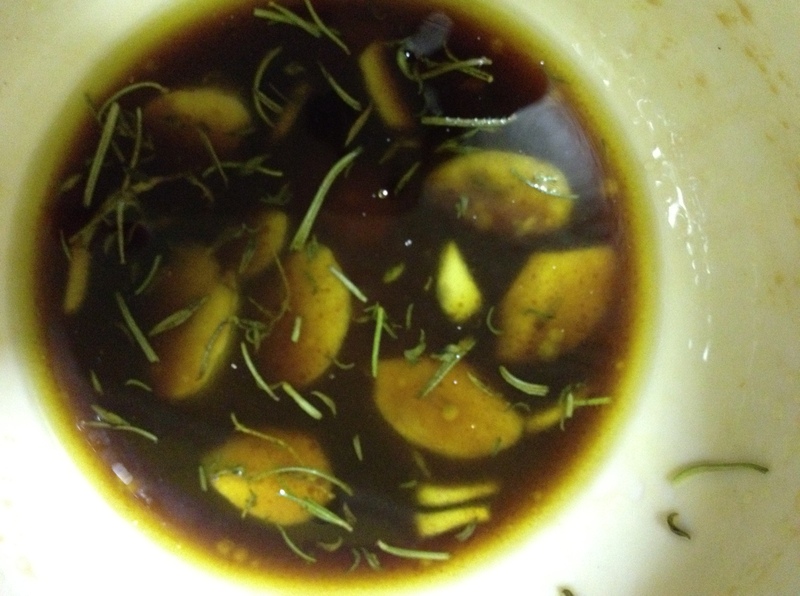 It has really helped to broaden our cooking horizons, Our marinade consisted of many cloves of garlic sliced thin, basalmic vinegar, oil, rosemary, sugar, salt and pepper. The rest of our red peppers were pickled in sugar, water, cider vinegar, pink peppercorns, and coriander seed, also based off part of an Ottolenghi recipe. Since we didn’t process the jar after packing it, these are a quick pickle that will last a few weeks in the fridge. 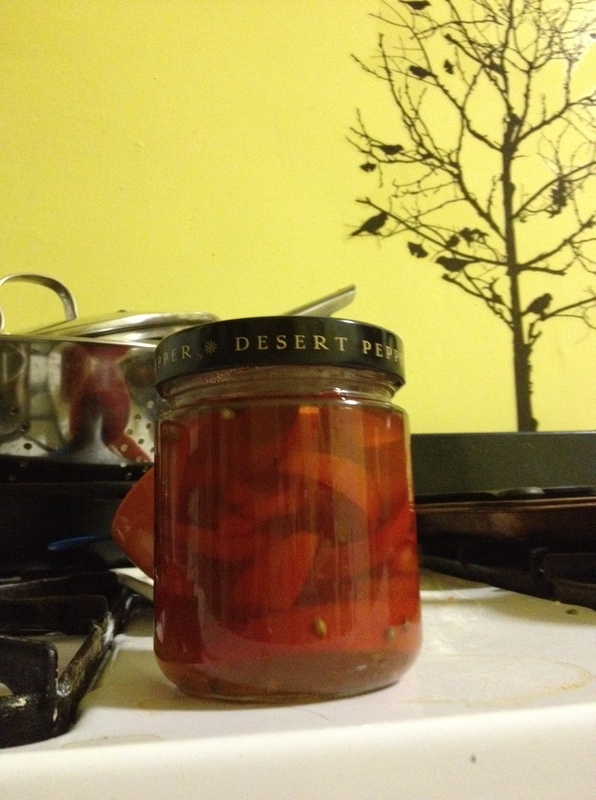 The brine was simmered for 20 minutes on the stove top, then poured over the pepper slices in the jar. Since we’ve been getting such lovely greens in our share, we make pesto almost every time we pick up! 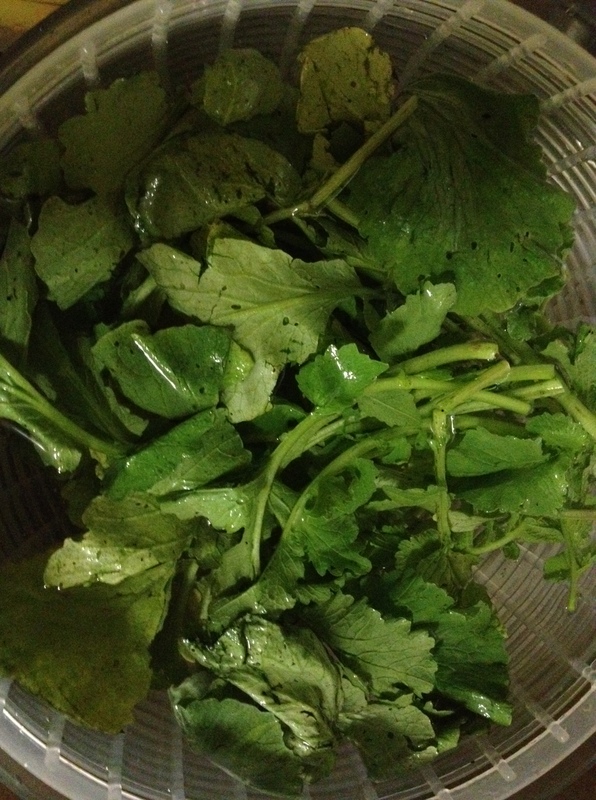 This week brought us a healthy bunch of radish greens. After they were washed in our salad spinner, they went into our food processor, along with pumpkin seeds, garlic, plenty of olive oil, and parmesan cheese. 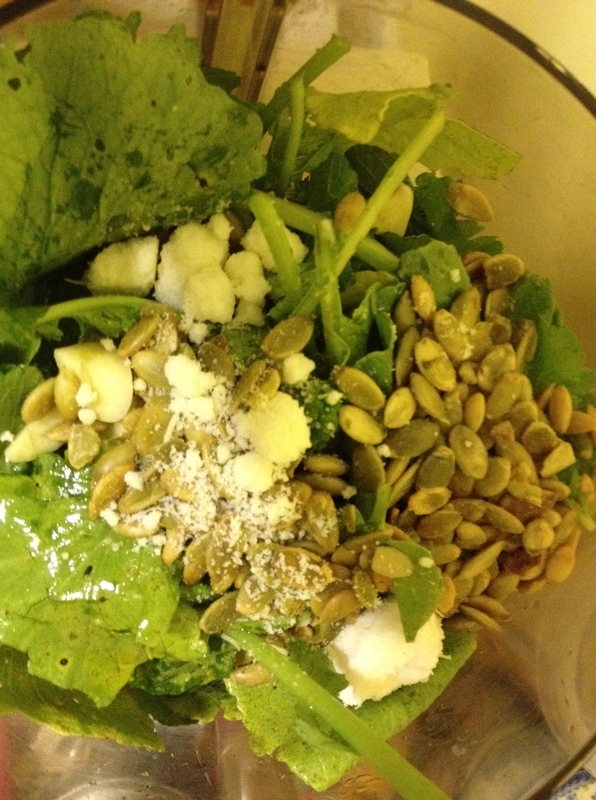 Since we’ve been making pesto so often, we just toss in any kind of nut or seed along with whatever greens are on hand. Pesto is pretty hard to mess up, so it’s great to experiment with! My favorite mixes kale, basil, and walnuts. The pesto and peppers became excellent sandwiches this week, along with slices of the tomatoes that were in our share. Since we have the berry and orchard share, we received a lot of apples in this pick up. Since we had so many, we did a little experimenting. 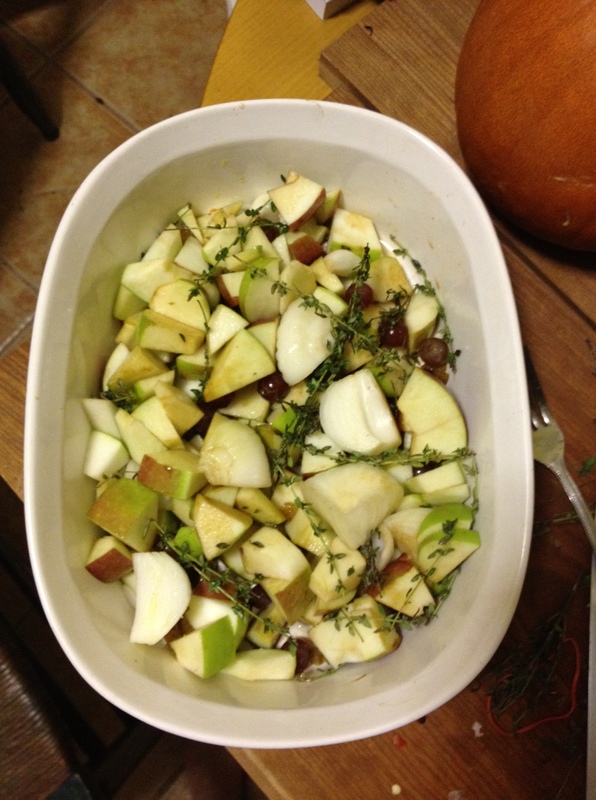 One roasted bunch combined apples, cippolini onion, golden raisins, seedless grapes, thyme sprigs, a little balsamic and a little malt vinegar. 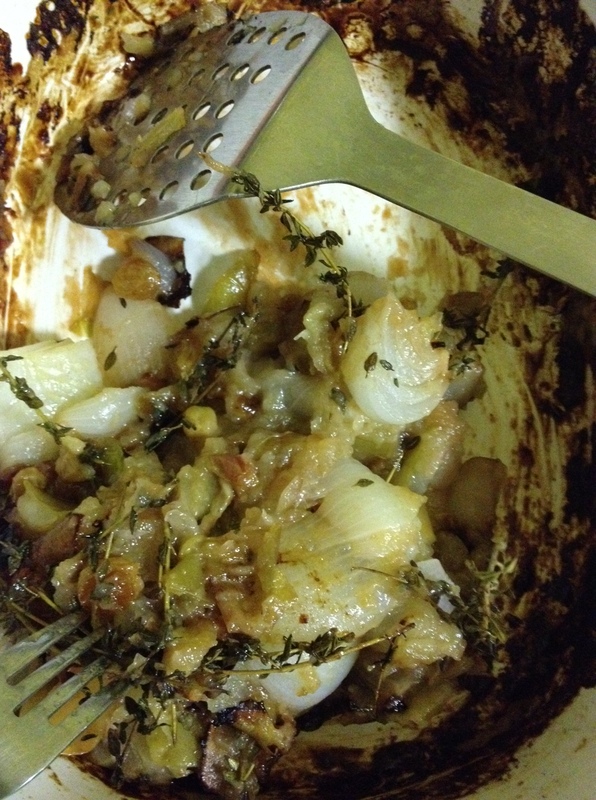 Since they were accidentally forgotten in the oven at 400 degrees for close to an hour, they cooked down to a mush. 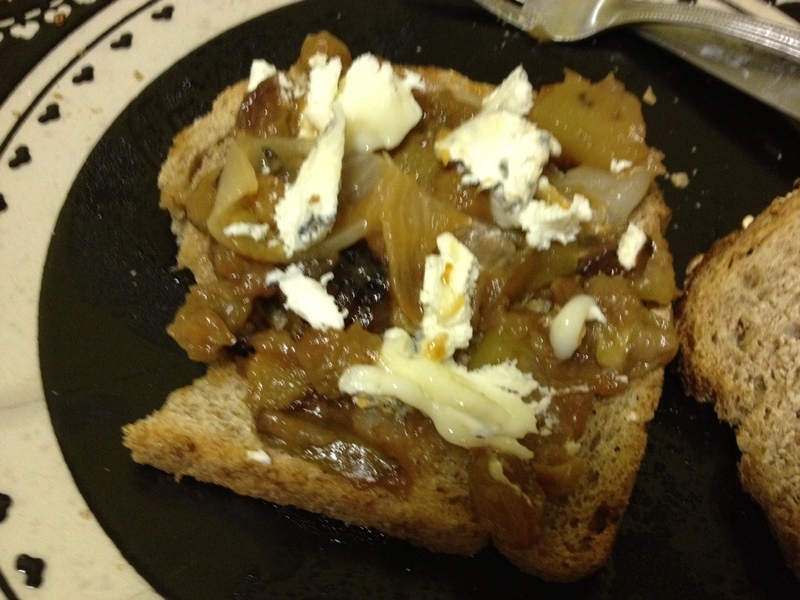 However, this was a happy accident, since the mush was an excellent snack spread on toast with Humboldt Fog cheese on top! Apples also become breakfast this week. 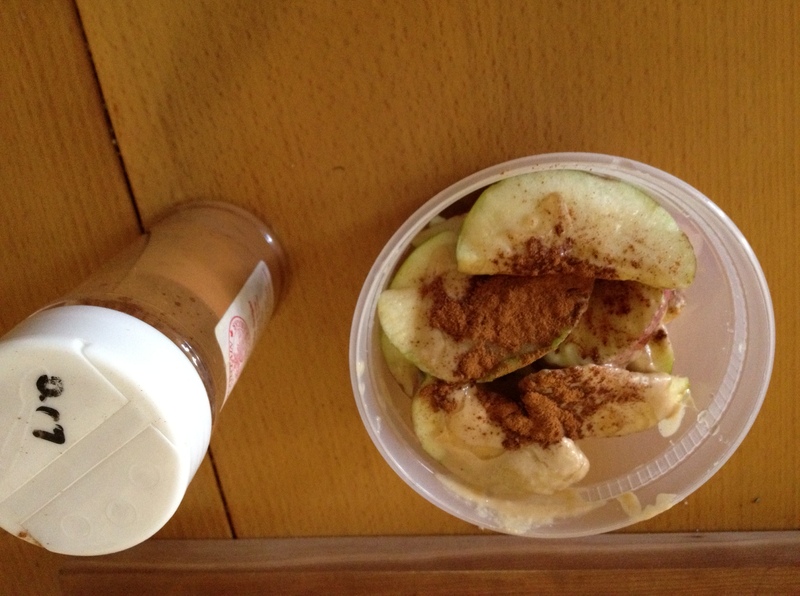 A favorite way to eat them is to combine apple slices, a few slices of tahini, a drizzle of honey, and cinnamon. 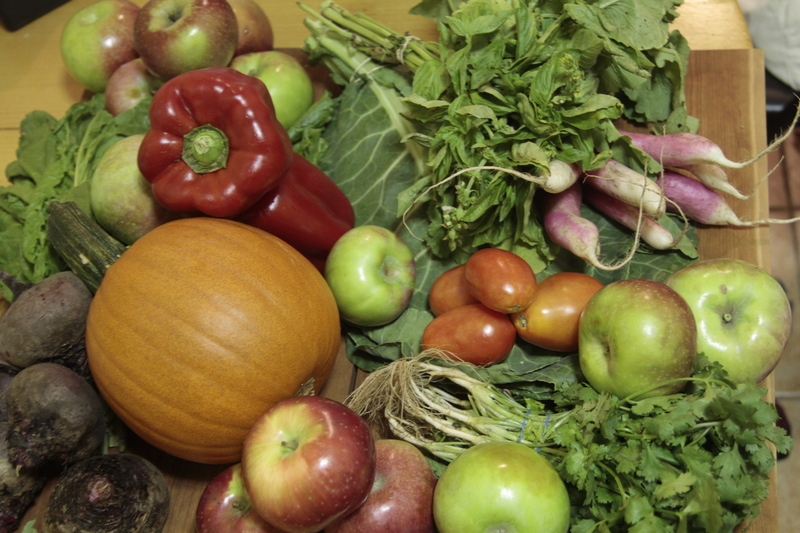 Thank you to Louisa Shafia, whose book Lucid Food gave us this idea. If, like us, you still have blackberries in your freezer from your Grieg Farm share, they are delicious in this mix too.